red and yellow and rhymes with bell? The company that i am starting work with on Monday! After slightly more than a year of "career break" dispensing my time in London, I have found myself a new job (with an old competitor, none less) and I am more than ecstatic about this role and the company. Yayyy!! Ok.. meantime I need to run all my arrands before Monday. 1. Perm my hair (?) 2. Banking 3. Make appointments to look at venues ah hem.. if you'd excuse me I need to get started. Someone is gonna be very busy! Tomorrow will be the last day of the Chinese New year celebrations. The last day is also a "lover's day", the chinese version of the Valentines Day. During the 1st day, my family and I made the annual ritual of visiting the Thean Hou Temple for prayers. 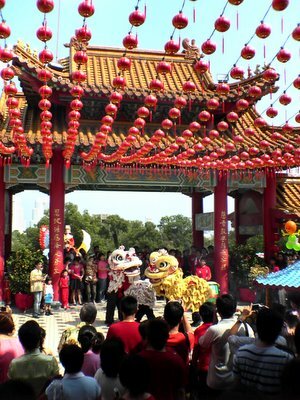 The lion dance at Thean Hou Temple... !